Maybe the amazing thing about Arthur’s “Fountain Abbey” parody is not that it’s so inventive, but the fact that the show is still so inventive after nearly two decades. Yes, Arthur, which debuted in 1996, is now only second to Sesame Street in terms of longevity for the PBS Kids brand. Based on Marc Brown’s popular series of books featuring an aardvark without a nose, Arthur’s extensive history is commendable. Its longevity has caused some problems for the show: namely the rotating in of new voice actors as the younger ones age out of their respective parts. But Arthur’s 19th season still shows the Read family and their friends intact: introspective Arthur, mischievous D.W., lofty Muffy, no-nonsense Francine, sincere Buster, and the well-meaning Brain. 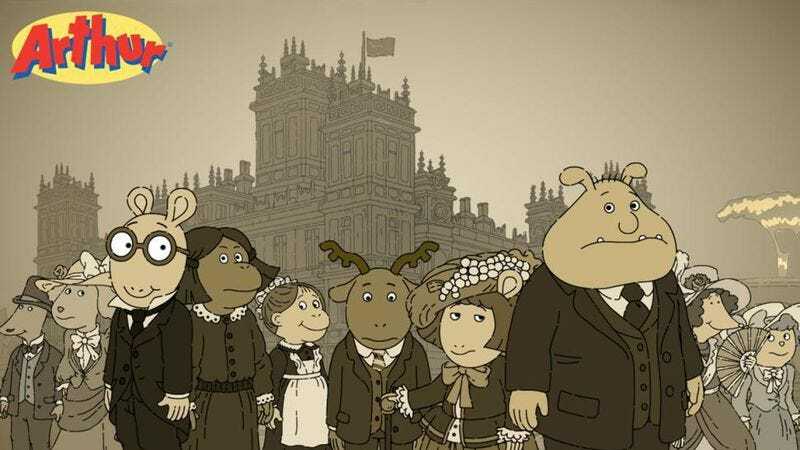 Arthur has tackled parodies before (even The Sopranos), but its PBS crossover with juggernaut Downton Abbey (“Fountain Abbey”) offers the kids’ show an opportunity to tackle heady concerns like class structure. Snooty Muffy’s family is researching its history, which she is sure will lead to the discovery that she is descended from a princess, housed at England’s famed Fountain Abbey. After the arrival of her great-grandmother Mary Alice’s diary, Muffy finds out instead that her relative was a common maid, and to add to the indignity, to one of Brain’s ancestors! Of course, this revelation offers the opportunity for an Arthur-filled flashback, with Arthur in the Mr. Carson role, Francine as a surly O’Brien, and D.W. as the Dowager Countess, naturally (yelling at clumsy maid Mary Alice as she serves lunch, “That’s quite enough! If I wanted to wear the soup, I would have summoned my dressmaker!”). The accents fluctuate enough to be charmingly problematic as each of the voice actors brings a different dialect to the table, from some sort of Cockney to possibly Scottish? “Fountain Abbey” also hilariously mimics Downton Abbey’s dramatic piano plinks in the soundtrack, as Brain mournfully stares out the window of his estate. As Arthur episodes are broken down into two 15-minute segments, plots like the Downtown parody travel along just long enough before the jokes get old. The second segment, “Arthur Calls It,” involves Arthur calling a controversial baseball play; he says that Buster is out instead of safe, and his team loses the game. Will Arthur stick with what he believes is right, even though his friends think he’s wrong? Arthur being Arthur, of course he will, but there’s a nice moment when even the stubborn Francine admits that she has to respect his decision, even if she doesn’t agree with him. For a 1st- or 2nd-grade mentality, this is a beyond-valuable message (actually, for adults as well). For the rest of this week, Arthur will continue its pop-culture homages with nods to The Wizard of Oz and The Tell-Tale Heart as vehicles to display these key life lessons. 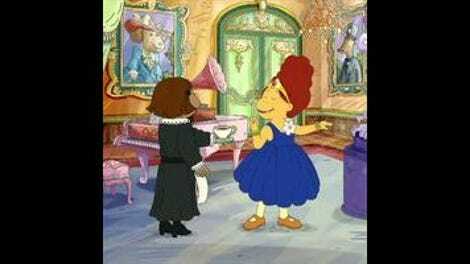 Muffy will probably never stop being superficial, but she always comes around in the end. Arthur and his pals may quarrel, but stay the closest of friends. And by showing that teaching kindness and honesty is always relevant, the sweet-but-not-cloying Arthur remains at the top of the heap for viewing by 4- to 8-year-olds (and their grateful parents). In addition to the soundtrack, the backgrounds that mimic Downton Abbey are impressive, such as all the volumes in the library, even the ones that hide Brain’s circus gear. In fact, all the backgrounds contain valuable little details, like the fact that Muffy’s bedroom wall mainly features pictures of herself. In Francine’s school poll, 72 percent of kids thought Buster was safe. Buster plans to write his memoir: I Was Safe. Muffy suggests the singular Safe, which will work better for the inevitable sequels, Safe 2, and Safe 3.